May 24, 2016 May 13, 2016 by Beau H.
The best part about spring style — other than the fact that it’s, well, finally warm out — is the way in which you can take pieces you’d wear the rest of the year and still combine them into a weather-friendly outfit (that is, not too hot and not too cold). In this instance, we’re talking casual-yet-crisp basics like the essential chambray shirt and an always-classic pair of slim khaki chinos, brought together in this instance by a pair of sharp-as-heck suede wingtips. Yes, this outfit has something for everyone — whether you’re on the hunt for a pair of stylish men’s dress shoes like the below, or simply searching for another way to wear gear you’ve already got, it’s about time you brought it all together. That’s what we’ll focus on below — for other #menswear-centric outfit inspirations, check out what we’ve got going on over at Pinterest or via The Style Guide on Facebook; I’m always up for more #OOTD suggestions, too. So, let’s roll up those (chambray) shirt sleeves and get to work! A few items — like a four-season chambray shirt and classic (yet slim) chinos — are pulled together by crisp wingtips and a great jacket. The Shirt: JackThreads Chambray Shirt, $39 — As essential and easy of a pick to make as it gets, JackThreads really knows what’s up when it comes to well-done basics that are crazy-affordable. 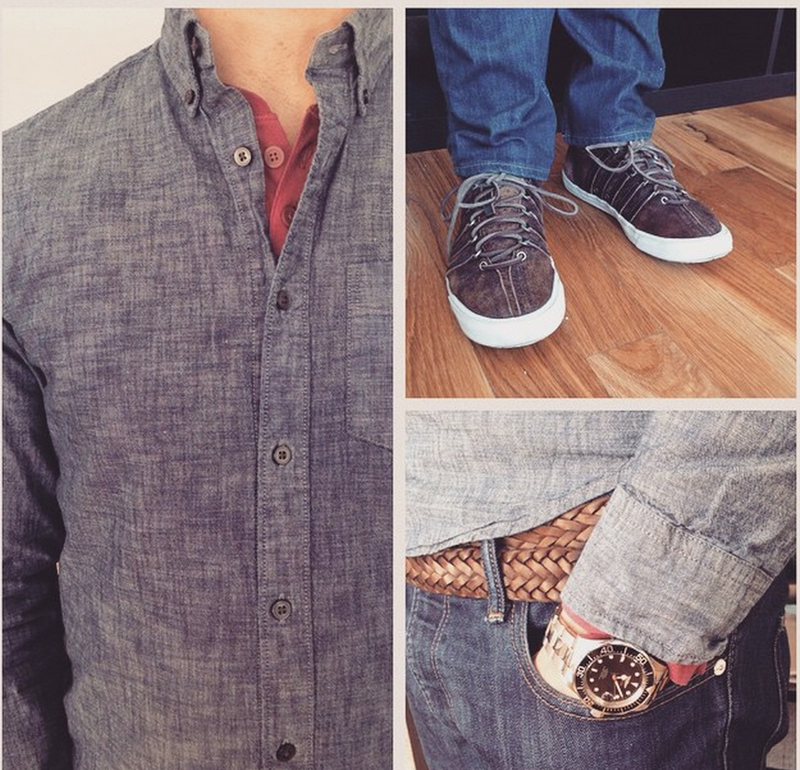 Start with your favorite chambray shirt, and go from there. The Jacket: Grayers Exmouth Nylon Blazer, $135 — Part blazer, part jacket and very spring-ready, this piece doubles as a rain coat should you need to bike, walk or run to work through a downpour (or if, y’know, you just fancy picking up a hybrid piece of outerwear). The Chinos: Buck Mason Sand Chinos, $135 — An investment-worthy pair of chinos from a brand that excels at crafting stellar pieces in the U.S.A., you should be able to wear these for years on end. The Shoes: M.Gemi Forte Wingtips in Dune, $248 — An average pair of wingtips, these are not. Superbly crafted, rich in color and somehow still featuring a sporty white sole, say hello to your favorite pair of summer dress shoes. 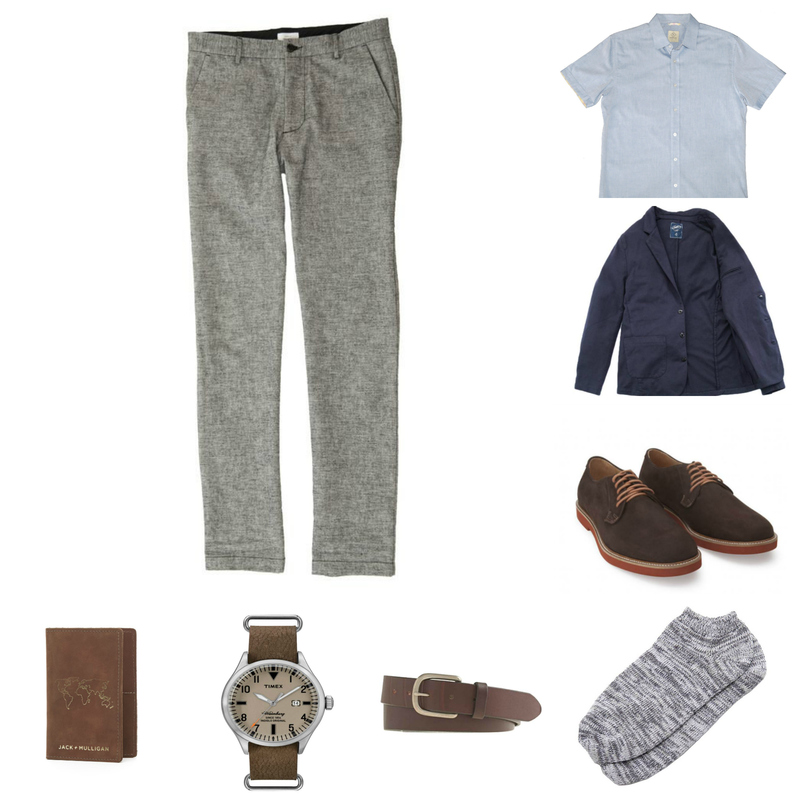 The Socks: Pair of Thieves Catch-22 No-Show Socks, $10 — Reliable no-show socks that don’t stick out from underneath those rolled chinos are going to push this outfit into warm-weather territory. The Watch: Invicta 8926 Pro Diver, $68.75 — This watch has long been a Style Guide favorite, and with plenty good reason: Standout looks, a tremendous price and great durability. It’s the right mix of rugged and casual here. The Belt: J. Crew Braided Cotton Belt, $29.50 — Swap out a brown leather dress belt for something lighter in color and made with spring in mind. The Bag: Wood & Faulk Field Bag, $150 — For an outfit that’s made with a commute in mind, grab a bag that’s commute-friendly — just big enough to handle your everyday carry should you need to hop on that bike (or on the train). Oftentimes, putting together an outfit to meet changing weather or changing plans is just about recognizing that certain pieces can be customized for year-round wear when updated the right way — so, taking those chinos and showing off some ankle, or adapting your traditional navy blue blazer to one that can handle spring breezes. Throw in some sporty wingtips, and you’ve got a look that should be comfortable and eye-catching, in the best possible way. ‘Til next time! Where might you rock this outfit? Any pieces that you would add or subtract? January 12, 2016 January 12, 2016 by Beau H.
Editor’s note: You’ve surely seen this hashtag lots of different places, including on Instagram. But how does that carry over to real life? The #OOTD series will take one great item and put together a versatile, stylish outfit around it. Look for these features regularly. Here at The Style Guide, there are a good number of recurring features, from the Style Pick of the Week series to Online Shopping Picks entries and product reviews. You can add to that mix #OOTD features (which might or might not feature your humble author from time to time). Playing off everyone’s favorite Instagram hashtag (Outfit Of The Day), this series will take a slightly more visual, quick-hit approach to styling when compared to, say, the Style Suggestion scenarios (which will still be around, fear not). 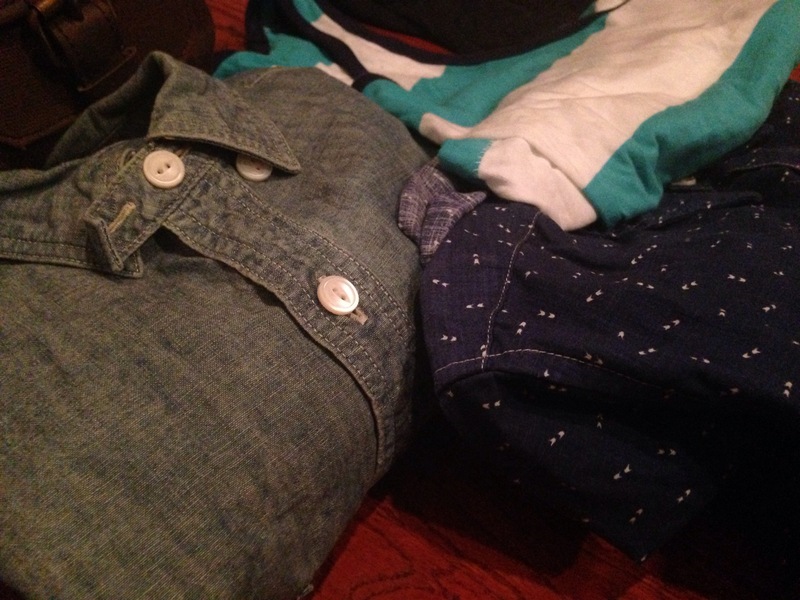 And today’s post is covering off on corduroy pants. They’re a cold-weather style staple, fit for wearing in situations both casual and dressy (look here for some great men’s corduroys if you still need a pair). 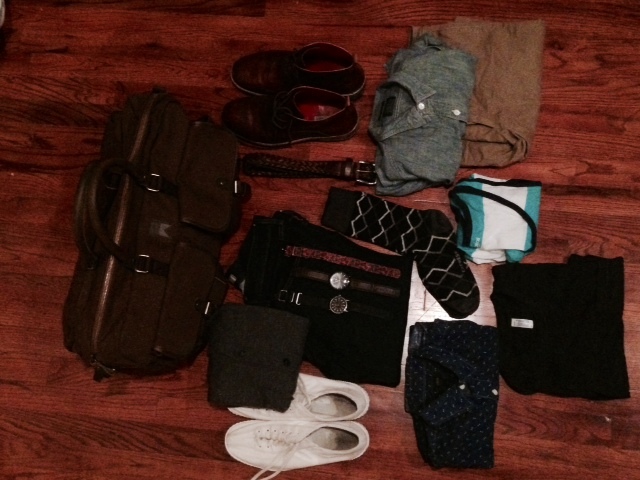 Let’s say you’re new to this whole thing, and want one basic outfit that can work … at work and elsewhere. Corduroys have the benefit of being a bit more versatile than jeans (that’s because of the rich color in the pair you’ll see below), and they also add some solid visual interest to an outfit. So they’re a natural fit for a high-low combination like we have here. Any questions or further notes on what you’d like to see? Give me a shout on Twitter or Instagram. One outfit that’ll cover you for a variety of situations. The Corduroys: Bonobos French Corders in Dark Khaki, $78 — Slim, stylish and nearly like your favorite khaki chinos — a solid outfit base without a doubt. The Shirt: GAP Clean Chambray Shirt, $59.95 — An old standby (as first seen here), the color plays nicely off the cords and the sweater. The Sweater: Reigning Champ Navy Crewneck Sweatshirt, $88.52 — Previously featured as the Style Pick of the Week, this isn’t your dad’s crewneck (of note: it’s slim, well-crafted and versatile). 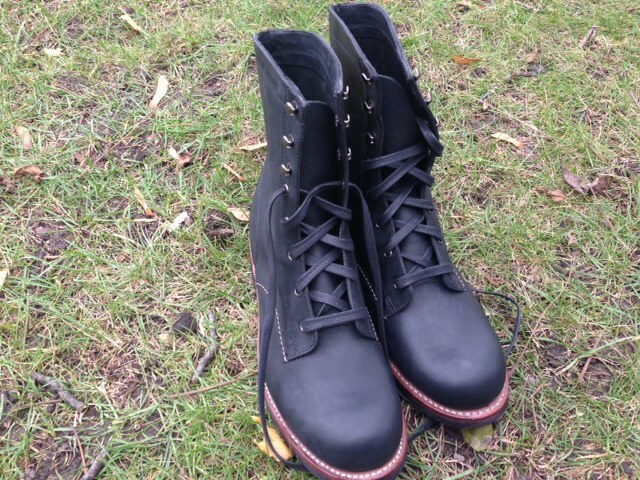 The Boots: Thursday Boot Company Brown Captain Boot, $199 — An agreeable price, great styling potential and solid durability; get the lowdown on other stylish winter boots if you’d like. The Socks: J. Crew Camp Socks, $14.50 — A neutral color, some nice stripe action and a thicker knit than normal dress socks — all big positives in winter. The Belt: Tanner Goods Heritage Belt, $110 — Heck yes, this belt’s expensive. And heck yes, it’ll last you for years and years and years (but here’s a more budget-friendly option). The Watch: Daniel Wellington Classic Bristol Watch, $229 — A step up in price from a Timex — but all the better for it. November 25, 2014 November 25, 2014 by Beau H.
At most times of year, and particularly Thanksgiving, it’s important to take time to celebrate with family and loved ones while enjoying some much-needed relaxation. Putting some thought into what you wear is just one way to make the occasion even more special. And you want to look good in those photos, right? Enjoy the week and Happy Thanksgiving! Thanksgiving oftentimes toes the line between between dressed-up and dressed-down, falling usually on one side of the spectrum. With some modifications, the outfit suggestion below should be able to fit in either way. The most important thing, though, is spending the day with those you love — if you’re able to dress well to do that, all the better! 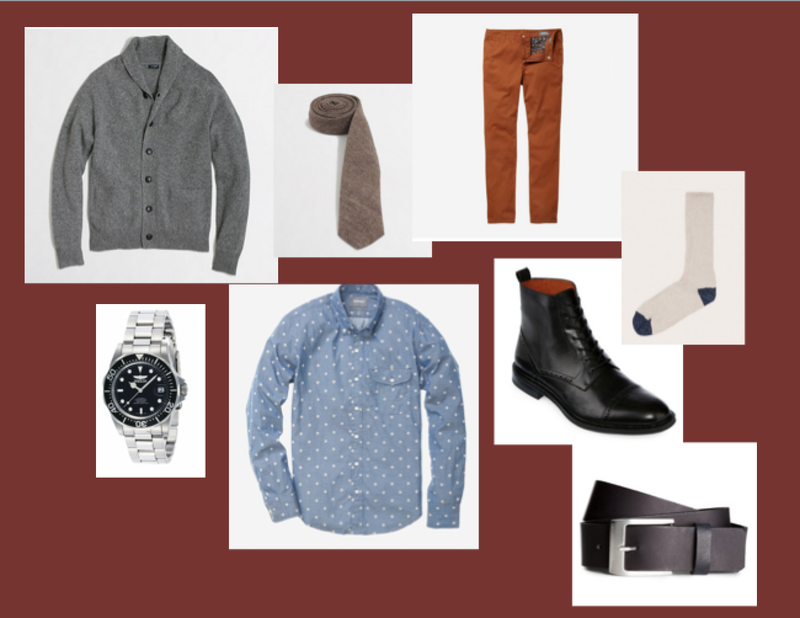 And for other Thanksgiving style ideas, see last year’s post. Keeping things casual, yet crisp, for Turkey Day. Cardigan: J. Crew Factory. Tie: JCF. Shirt & Pants: Bonobos. Watch: Invicta. Boots: JC Penney. Belt: H&M. Socks: Oak Street Bootmakers. This shawl collar cardigan provides more bulk and texture than a thinner cardigan (although a trim cotton cardigan could work if you go dressier). The marled grey color also fits in well with the shades of the season while not being too outrageously bright, unlike some sweaters on the market. If the situation calls for getting more dressed up, navy corduroy blazer would work just fine. The Bonobos option is a pretty substantial chunk of change for a regular, more casual buttondown shirt, but the twill fabric and diamond print add some nice texture and visual detail to the piece. Twill also adds some heft to stand up to that thicker cardigan. On the cheaper side, a dark denim shirt from J. Crew Factory provides that same visual bulk for a much lower price. 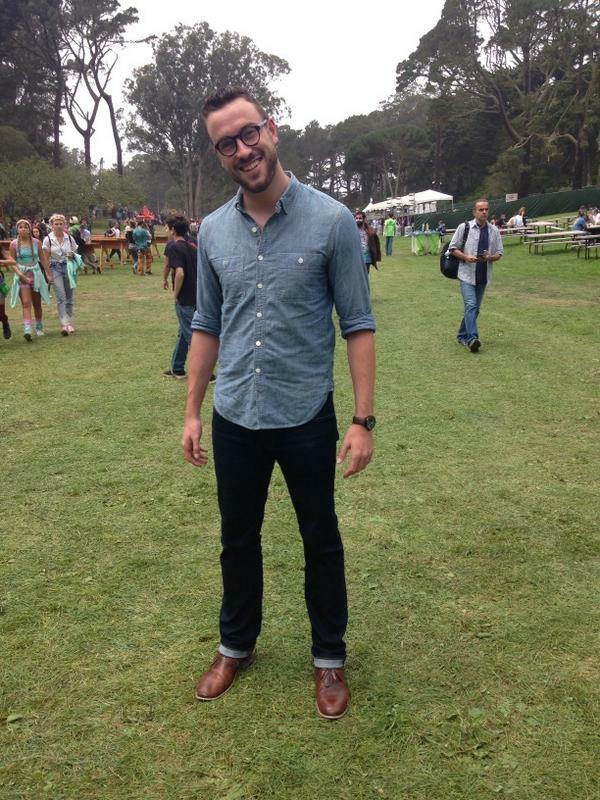 And, a classic chambray shirt would also be a serviceable option. Some Thanksgiving dinners lean much more casual, and in that case, you could definitely ditch the tie. But should you want to reach for some neckwear, stick with a seasonal fabric with some depth to it — this brown herringbone piece changes up the typical charcoal wool tie you might see (Frank & Oak offered a standout option last year). 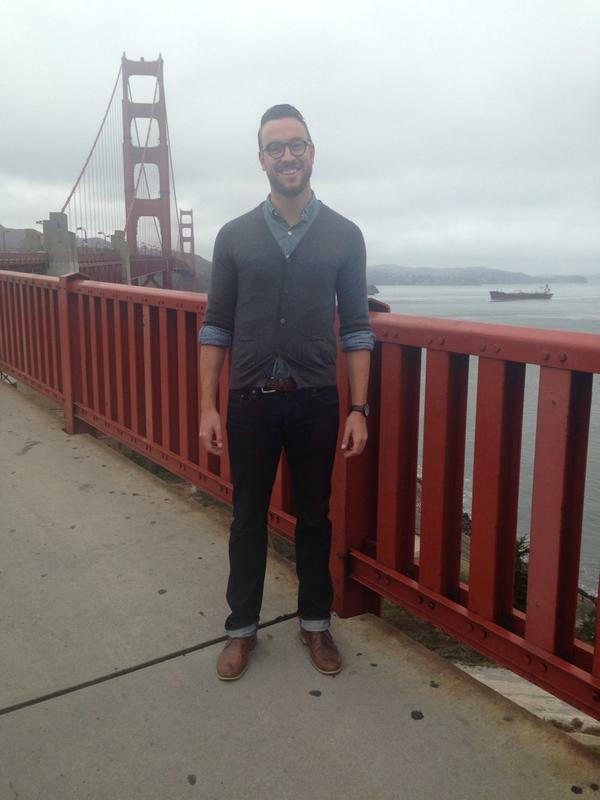 It also blends nicely in terms of texture with that thicker cardigan and heavier shirt. Need a tie bar to keep it in place? Your go-to place is, of course, The Tie Bar. Again, this is quite the expensive option for a simple pair of pants — but, on a personal note, these pants have gotten tons of mileage this fall, and that’s sure to hold true this upcoming winter as well. They don’t have the heft of a pair of corduroys, which one might typically go for at Thanksgiving, but like the rest of this outfit, these options are geared to go either dressier or more casual — washed chinos hit the middle perfectly. 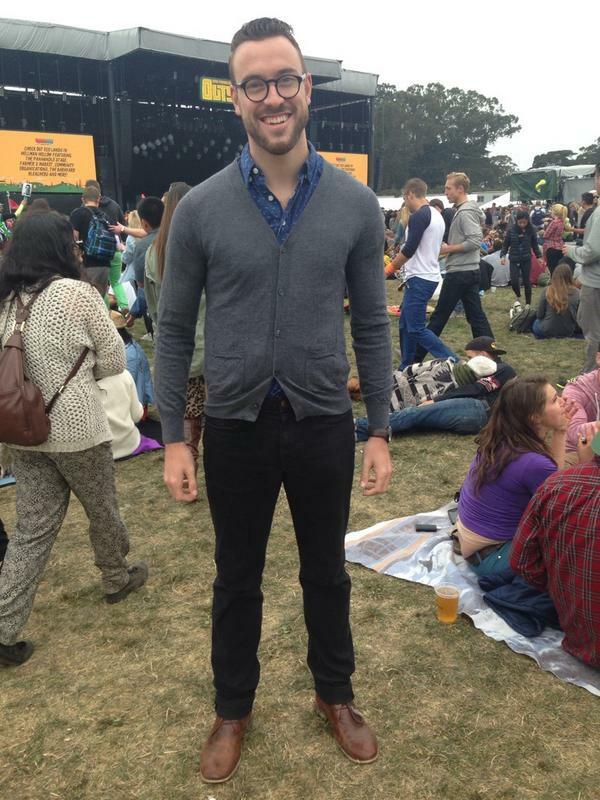 Many love Bonobos for their fit and great customer service, too. On the less expensive side, you could reach for a twill pant in a similar deep fall shade. Assuming that most of us will be in a colder clime for the holiday with the polar vortex that’s sweeping the nation, captoe boots serve two functions: they combat the snow and also add a dash of style for sweeping through cold weather (see what I did there?). They aren’t the much-beloved brown Stafford wingtip, but black boots help to ground what’s already a pretty color-rich outfit. 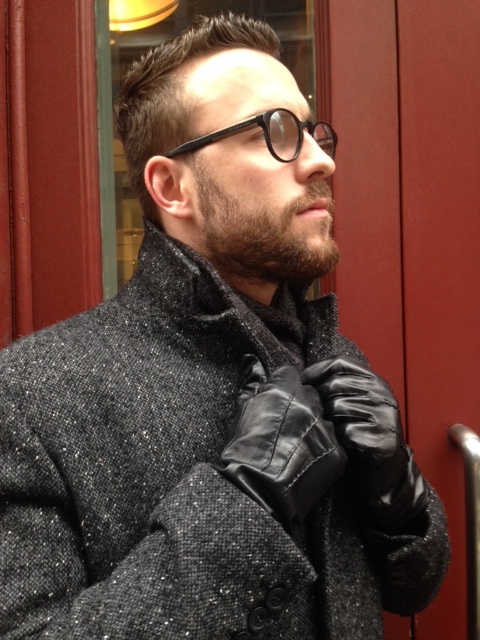 They also look a little slicker, helping bring a more dressed-up appeal to the ensemble. If you go really rugged-casual, some new boots from Frank & Oak could also meet the two criteria above. Since we want maximum versatility in an outfit, this Invicta watch, which calls to mind the Rolex Submariner, is as classic and stylish an option as any. And although it’s not necessary, the black dial conveniently matches up with those boots. 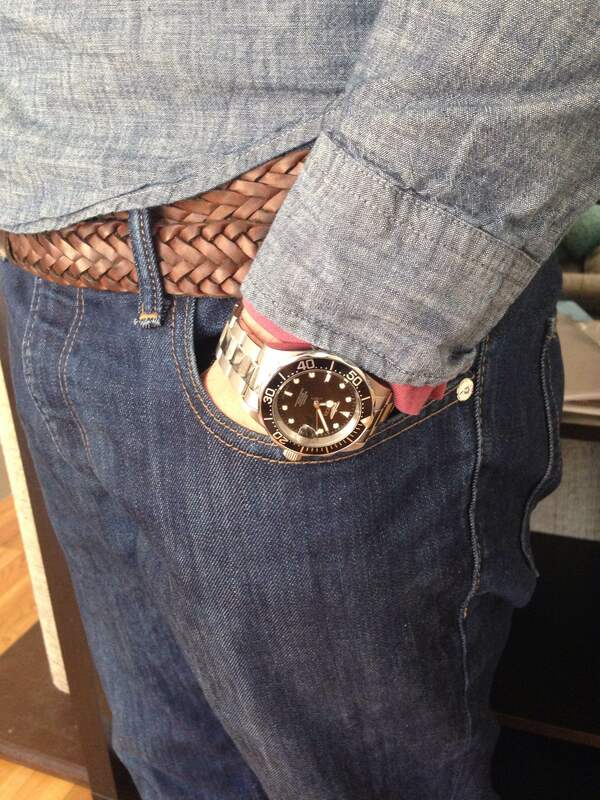 If you go more casual, a Timex Weekender with a simple canvas strap is always a safe bet, too. Since it’s going to be chilly out there, thicker socks that stay stylish thanks to their marled texture work very well with those black captoe boots above. Make sure your belt matches up with those boots, too. What are your thoughts on the above picks? Anything you would change or add? What will you be wearing on the holiday?